Henry Miller Jr., 52, was with Ladder 105 for 28 years. Three separate times he declined to retire because he loved being a firefighter. Just as he had for the 1993 WTC bombing, Miller chauffered 105’s hook and ladder to the WTC that morning and parked it in front of the Marriott Hotel. That’s where it was later found, flattened by the debris. He had studied to be an accountant but it wasn’t long before Miller knew he’d really rather follow his father, a 38-year vet, into the FDNY. Just 7 years before 9/11 he had married his best friend’s sister – someone he had known since she was 17. They were casually friendly for years and then one year things changed. When they married, he gained a ready-made family. Rumor has it he was actually really thinking about retiring in another 2 years. 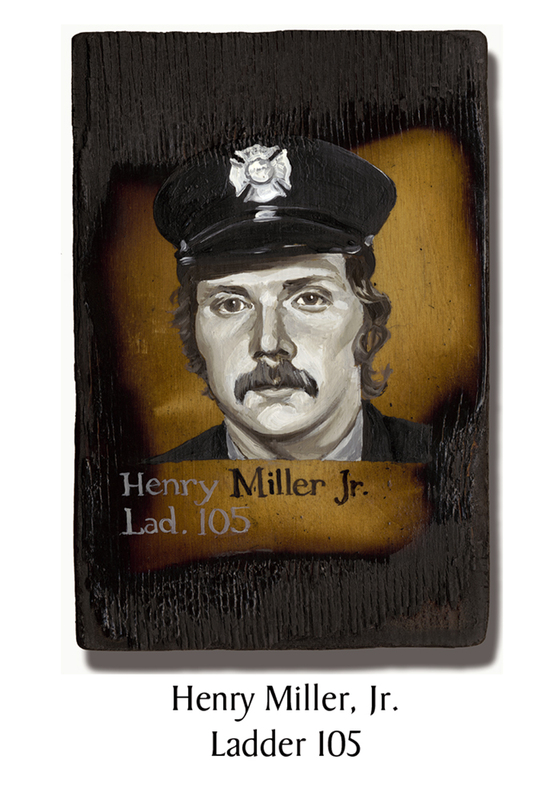 This entry was posted in Better Angels Stories and tagged 343, 9/11, better angels, Dawn Siebel, FDNY, firefighter, firefighters, firefighters of 9/11, Henry Miller Jr, Ladder Co. 105, LODD, Manhattan, memorial, NFFF, paintings, portraits, World Trade Center, WTC. Bookmark the permalink.